The Beni Marin were a tribe of Nomadic Zenata Berbers who came from an area between Taza and Algeria. The policy of the Merinides in running the affairs of Morocco was enlightened they the first Moroccans to introduce a simple form of civil service. They were also the first to introduce the Mellah, or Jewish quarters in all major tows, so that the Jewish could live secure and unmolested. The Merinides were also the first to introduce the concept of Medersa(originated from Baghdad and later on introduced to Egypt). Fez is liberally scattered with fine examples within easy walking distance of the Karawiyine. Sultan Abu Inan built the Bou Inania Medersa in Fez. The Merinide Soltans surrounded themselves with scholars who could lecture not only about Koran but also about science and law , poetry and geography. The well-known traveller Ibn Batuta( 1304-78) was an honored member of the court of Abou Inan who gave him a secretary to write down stories of his travels as in the black Sea and Tambouktoo. Ibn Khaldoun, the 14 C historian and a Spanish Muslim spent many years as adviser and close associate of Merinide Sultans. When the dynasty was feebled, Spain and Portugal were turning eyes towards Morocco . At that time, there was another ruler, Ibn Wattas, who came from Asilah to Fez. When he left Asilah, the Portugueuse invaded Asilah and took many family membersof Ibn Wattas and 5000 people as slaves, then Ibn Wattas signed a treaty with Portugal which allowed the portugueuse to invade Asilah, Tangier , Essaouira(Mogador)Mazagan (El Jadida) Zemmour, Safi and Agadir and Ceuta. So, for a time, almost the entire west coast of Morocco became a seperate Portugueuse colony. ALMOHADES (properly Muwahhadis, i.e. "Unitarians," the name being corrupted through the Spanish), a Mahommedan religious power which founded the fifth Moorish dynasty in the 12th century, and conquered all northern Africa as far as Egypt, together with Moslem Spain. It originated with Mahommed ibn Tumart, a member of the Masmuda, a Berber tribe of the Atlas. Ibn Tumart was the son of a lamplighter in a mosque and had been noted for his piety from his youth; he was small, ugly, and misshapen and lived the life of a devotee-beggar. As a youth he performed the pilgrimage to Mecca, whence he was expelled on account of his severe strictures on the laxity of others, and thence wandered to Bagdad, where he attached himself to the school of the orthodox doctor al Ashari. But he made a system of his own by combining the teaching of his master with parts of the doctrines of others, and with mysticism imbibed from the great teacher Ghazali. His main principle was a rigid unitarianism which denied the independent existence of the attributes of God, as being incompatible with his unity, and therefore a polytheistic idea. Mahommed in fact represented a revolt against the anthropomorphism of commonplace Mahommedan orthodoxy, but he was a rigid predestinarian and a strict observer of the law. After his return to Morocco at the age of twenty-eight, he began preaching and agitating, heading riotous attacks on wine-shops and on other manifestations of laxity. He even went so far as to assault the sister of the Murabti (Almoravide) amir'Ali III., in the streets of Fez, because she was going about unveiled after the manner of Berber women. 'Ali, who was very deferential to any exhibition of piety, allowed him to escape unpunished. Ibn Tumart, who had been driven from several other towns for exhibitions of reforming zeal, now took refuge among his own people, the Masmuda, in the Atlas. It is highly probable that his influence would not have outlived him, if he had not found a lieutenant in 'Abd-el-Mumin el Kumi, another Berber, from Algeria, who was undoubtedly a soldier and statesman of a high order. When Ibn Tumart died in 1128 at the monastery or ribat which he had founded in the Atlas at Tinmal, after suffering a severe defeat by the Murabtis, 'Abd-el-Mumin kept his death secret for two years, till his own influence was established. He then came forward as the lieutenant of the Mahdi Ibn Tumart. Between 1130 and his death in 1163, 'Abd-el-Mumin not only rooted out the Murabtis, but extended his power over all northern Africa as far as Egypt, becoming amir of Morocco in 1149. Mahommedan Spain followed the fate of Africa, and in 1170 the Muwahhadis transferred their capital to Seville, a step followed by the founding of the great mosque, now superseded by the cathedral, the tower of which they erected in 1184 to mark the accession of Ya'kub el Mansur. From the time of Yusef II., however, they governed their co-religionists in Spain and Central North Africa through lieutenants, their dominions outside Morocco being treated as provinces. When their amirs crossed the Straits it was to lead a jehad against the Christians and to return fo their capital, Marrakesh. The Muwahhadi princes had a longer and a more distinguished career than the Murabtis or "Almoravides" (q.v..) Yusef II. or "Abu Ya'kub" (1163-1184), and Ya'kub I. or "El Mansur" (1184-1199), the successors of Abd-el-Mumin, were both able men. They were fanatical, and their tyranny drove numbers of their Jewish and Christian subjects to take refuge in the growing Christian states of Portugal, Castile and Aragon. But in the end they became less fanatical than the Murabtis, and Ya'kub el Mansur was a highly accomplished man, who wrote a good Arabic style and who protected the philosopher Averroes. His title of El Mansur, "The Victorious," was earned by the defeat he inflicted on Alphonso VIII. of Castile at Alarcos in 1195. But the Christian states in Spain were becoming too well organized to be overrun by the Mahommedans, and the Muwahhadis made no permanent advance against them. In 1212 Mahommed III., "En-Nasir" (1199-1214), the successor of El Mansur, was utterly defeated by the allied five Christian princes of Spain, Navarre and Portugal, at Las Navas de Tolosa in the Sierra Morena. All the Moorish dominions in Spain were lost in the next few years, partly by the Christian conquest of Andalusia, and partly by the revolt of the Mahommedans of Granada, who put themselves under the protection of the Christian kings and became their vassals. Almoravids (ălmôr'əvĭdz) , Berber Muslim dynasty that ruled Morocco and Muslim Spain in the 11th and 12th cent. The Almoravids may have originated in what is now Mauritania. The real founder was Abd Allah ibn Yasin, who by military force converted a number of Saharan tribes to his own reformed religion and then advanced on Morocco. After his death (c.1059), Yusuf ibn Tashfin and his brother Abu Bakr came to power. Marrakech was founded in 1062 and was the center of a powerful empire. Called by the Moors in Spain to help stem Christian reconquest, Yusuf entered Andalusia and defeated (1086) Alfonso VI of Castile. He later subdued the local Muslim rulers and governed Muslim Spain and N Morocco (Abu Bakr ruling over S Morocco). The dynasty also pushed south, destroying the ancient state of Ghana. The Almoravids were rough and puritanical, contemptuous of the luxurious Muslim courts in Spain. Their rule was never entirely stable and in the 12th cent. was attacked by the Almohads, who finally (by 1174) won both Morocco and Muslim Spain. 1- Ziri ibn `Atia 988-1001. 2-moo. El M uaz 1001-1026. 5- El Fatuh and `Ajisa 1060-1065. The Magrawa were a Berber tribe in central and western Algeria. The Magrawa, a tribe of Zanata Berbers, were one of the first Berber tribes to submit to Islam in the 7th century. They supported Uqba ibn Nafi in his campaign to the Atlantic in 683. They were Kharijites from the 8th century, and allied first with the Idrisids, and, from the 10th century, with the Umayyads of Córdoba. As a result they were caught up in the Umayyad-Fatimid conflict in Morocco. Although they won a victory over the allies of the Fatimids in 924, they soon became allied with them themselves. When they switched back to the side of Córdoba, they were driven out of central Morocco by the Zirids, who ruled on behalf of the Fatimids. In 980, however, they were able to drive the Miknasa out of Sijilmasa. Under Ziri ibn Atiyya (to 1001) the Magrawa achieved supremacy in Fez under Umayyad suzerainty and expanded their territory at the expense of the Banu Ifran. A revolt against the Umayyads was put down by Al-Mansur, although the Magrawa were able to regain power in Fez. Under the succeeding rulers al-Muizz (1001-1026), Hamman (1026-1039) and Dunas (1039) they consolidated their rule in northern and central Morocco. However, internal power struggles after 1060 enabled the Almoravids to conquer them in 1070 and put an end to their rule. 10- Al-Hajjâm al-Hasan ben Muhammad ben al-Qâsim 922-925. 15-Hassan II 954-974(not Hassan II, born 1929). The founder of the dynasty was Idris ibn Abdallah (788-791), who traced his ancestry back to Ali ibn Abi Talib and Fatima. As a Shiite he was persecuted by the Abbasids and fled to the Maghreb in 786, where he was taken in by the Berbers. Since the Maysara uprising against Arab rule (739-742), the authority of the Caliphate in North Africa had been compromised; the new kingdom of Idris I represented the first autonomous Islamic state in Morocco. His son Idris II (791-828) developed the area of Fez, already colonised by his father, as a royal residence and capital. Through the settlement of refugees from Kairouan and Andalusia the city quickly became the focus for the Islamification and Arabisation of North Africa: compare the rise of Islam in Algeria. The realm was also extended through campaigns into the high Atlas Mountains and against Tlemcen, with the result that the Idrisid state became the most significant power in Morocco, ahead of the principalites of the Bargawata, the Salihids, the Miknasa and the Maghrawa of Sijilmasa. Under Muhammad (828-836) the kingdom was divided amongst eight brothers, whereby several Idrisid statelets formed in northern Morocco. This led to intensified power struggles and the weakening of the Idrisids. Even when the realm was reunified under Yahya IV (904-921), it still lost significance through internal strife and attack from the Miknasa, who were Fatimid allies. After a defeat by the Miknasa in 905 the Idrisids were driven from Fez. Only with the support of the Caliphate of Cordoba could the dynasty subsequently hold out against the Fatimids and their allies. After 926 the Idrisids abandoned Fez for good and withdrew to the valleys of the Rif mountains. The last Idrisid was deposed in 985, and they were succeeded in Morocco by the principality of the Maghrawa. About king Année 1987 This documentary brush a table of the principal events which proceeded in this country of North Africa starting from the accession with the throne of the king Hassan II, in 1961, until green Walk in 1975. Images of war alternate with scenes of the country, working life and chocolate éclair of this country. In an exclusive interview granted in 1985, Hassan II delivers without fear the various feelings which animated it during all these years. 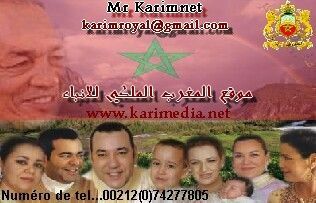 the exclusive interview of the king hasan 2 with palait royal of reduction with the chains (tv5 world) and it (rtm) in the emission fracaise lheure of truth and other interviews of the king hasan 2 At also the videos of SM the king mohamed 6 and the royal family of Morocco in the bank of the videos royals on the site (MOROCCO ROTAL) in Arabic . thanks warren and shrifia for you're post i am antersted in history in general and the history of the royal famillies in morocco is really fabulous. i hope you keep posting. Some sites disappear and never see the light of day again, unfortunately. Amazing to read the history of Morrocan Sultans. Shrifia thank you for the posts. I love history and I think Morocco has an intersting and rich history you can't be bored at all.